Logan Cochrane Why Don’t the Poor Rise Up? ​An article in the New York Times in 2015 provoked Michael Truscello and Ajamu Nangwaya to bring together the volume: "Why Don't the Poor Rise Up? 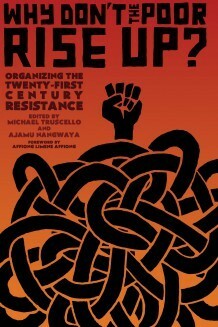 Organizing the Twenty-First Century Resistance" (2017). This book is divided into two sections, one on the Global North and another on the Global South, and is an "anthology of radical perspectives on contemporary struggles" (p. 2). The book is a counter narrative to the idea suggested in the New York Times that the poor are not rising up. "The title is both challenging and provocative, in the sense that it is at once a question and an assumption. But is it true that the poor do not rise up? Or do we simply not recognize their resistance and rebellion?" (p. 1). In documenting stories of resistance, the authors seek to address an apparent gap: "We do not have enough knowledge and information on the diverse struggles waged around the world, the wealth of experiences gained, and the lessons learnt from them and numerous victories achieved. Consequently, we do not celebrate them nor gain inspiration from them to wage new struggles. The first-hand experiences and contributions shared in this collection serve as a radical attempt to reverse this trend" (p. 3). From Gussai Sheikheldin: "States and markets normalize the exploitation and oppression of many in society through the pretext of order and justice… becoming aware of a phenomenon does not automatically imply that one will care to transform it, so understanding structural sources of oppression in society does not necessarily mean that one will seek to combat them. That is objectively true, but we should also be mindful that any genuine care is unlikely to happen without understanding. Then there's the difference between understanding on the one hand, and 'consciousness' (understanding and caring) on the other." (p. 233-235).